Steel Industries are very energy incentive and cost of energy contributes 20% to 40% of production cost per ton of steel depending upon energy efficiency improvement measures in place. In order to be competitive, every Steel Industry and other industries must focus on energy efficiency. Energy Efficiency improvement will also result in the reduction of CO2 emission. In India it is a regulatory requirement to comply with the PAT Targets enforced time to time by all the designated consumers from Iron and Steel Industries. 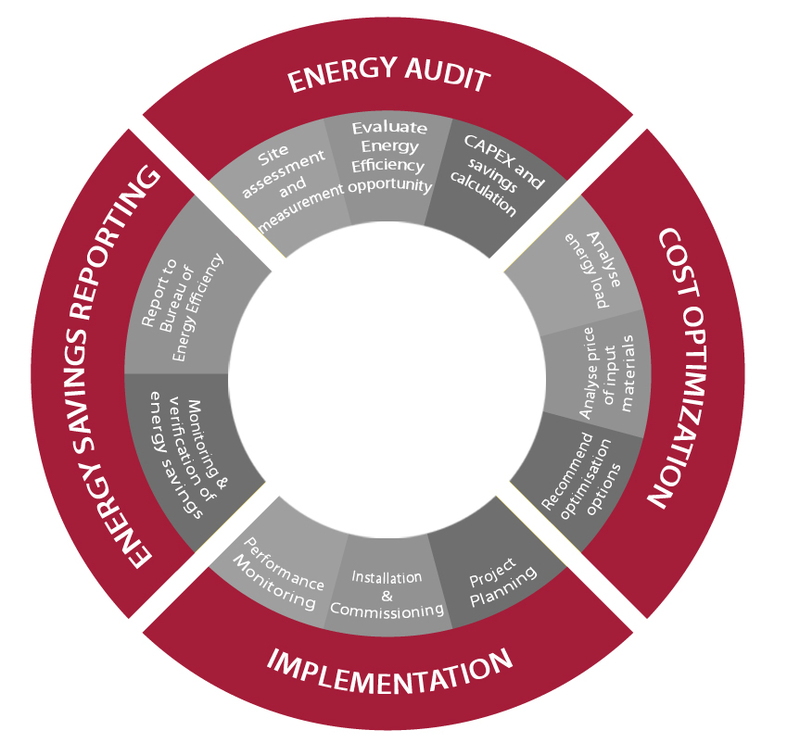 Comprehensive process energy efficiency improvement based Energy Audit of the Plant. Complete solution provider under one roof for implementation of energy savings projects from feasibility study to execution as Energy Service Company (ESCO). DASTUR's audit team comprises of Process Experts, Certified Energy Auditors, Plant Utility and Electrical Experts with both energy audit and six decades of engineering experience. DASTUR is thus uniquely positioned to find out maximum energy savings opportunities during energy audit and suggest implementable solutions from engineering perspective. While undertaking Energy audit achievement of PAT target is aimed. DASTUR can offer its services for implementation of energy savings schemes as ESCO Grade 2 Company. A complete package is provided without any risk to customers from conceptualization to commissioning and hand holding till recovery of Project Cost. Guaranteed Savings will be demonstrated through agreed measurement and verification procedures. Consultancy by DASTUR. Financing by Client and Execution by EPC Contractor engaged by Client. Shared Saving Contract inclusive of arranging full Finance. Payment by Client through EMI till project cost is paid back by opening an ESCROW account. DASTUR has BEE enlisted M&V firms, technology and other ESCO partners to meet any requirements of customers in Energy Front with complete peace of mind.